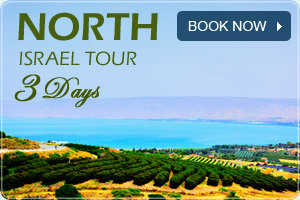 The tour commences as it moves in the northwards toward the ancient Safed City (Tzfad). Dubbed as the centre of Jewish mysticism as well as that of Kabala movement, Safed is among the four holy cities of Judaism. Enter Safed from the Acre-Rosh Pina Road, from a distance the beautiful hill filled with pine trees can be seen from a distance. At the first junction (near the “egged bus station”) turn right at Jerusalem Rd, then first turn left up Palmah St from there take a sharp turn right (by the sign to Ron Hotel) and climb up hativat yiftah Rd until the “Citadel Garden” Parking lot. (1) Where you should leave your car. Viewing towards the west the old city of Safed is revealed. This beautiful city was built on the slope leading down to the Amod River. From this point even mount Meron and the hills of Galilee can be seen, a marvelous site. From the parking lot, walk up through the Pine Gardens towards the hill top. (2) At the hill top stands a monument in honor of the soldiers who died at this site during the war of independence. From here there is an extraordinary view of the Sea of Galilee. This hill was chosen by the crusaders for its strategic values for one of their strongest fortress’ which was cleverly conquered in 1266 by the Muslim sultan Baberos which brought to the collapse of Crusaders Empire in this area. Baberos who destroyed all the coastline cities decided to use Safed as his capital of the northern area instead of Acre. Walk back down to the starting point and continue North on the road and after 100 meters you will notice on your right hand side the last remains of the great fortress (3), which was destroyed from earthquakes or in order to build up Safed. After a few meters on your left stands out the Israeli Biblical Museum. (4) Stop for a visit or pass by the museum and walk down the stairs towards Jerusalem Rd. This is a circular road which forks into Bar Yohai St. After 30 meters take a right turn down the stairs to Beck St. which leads to Freedman’s Bakery a wonderful bakery with delicious cakes. (5) Walk back to Bar-Yohai St. and continue along it. This is the Ashkenazi part of the Jewish Quarter. These wide streets and light colors dominate all this area. In between Bar Yohai number 47 and 49 there is a beautiful narrow alley worth seeing. (6) Bar-Yohai St will lead you to main circle of the Jewish Quarter. (7) Take a right turn and walk through the gate to the terraced garden, (8) this is where the famous Ashkenazi Rabbi Yitzhak would take his followers to welcome the Sabbath. This is already 16th century Safed. Two main events brought Safed to its glory days at the 16th century. The first is event was the expulsion of Jews from Spain to the Ottoman Empire. The other is the rise of the Ottoman (Turkish) Empire and conquering this land. They encouraged the Spanish Jews to settle down in Safed the holy city of the north from biblical times. Thus we naturally find in Safed the continuation of the success of the Spanish Jews’ heritage and culture. Such as the great Rabbi Itzhak’s ‘mishna’ which influenced Safed’s Jews and the entire Jewish community immensely to this day. Walk down the stairs towards the Ashkenazi synagogue which is worth a visit. (9) This is a typical Ashkenazi synagogue: Light colors, a few decorations emphasizing the wooden Holy Ark. Photo taken from Galilee Tours. The seats are arranged in rows in front of the Holy Ark and beside it are wall paintings of the western wall and the holy grave of Rachel which are commonly found all around Safed synagogues. From the Ashkenazi synagogue we will move on to the Sephardic quarter this. The route to this quarter is a bit complicated so we advise to use a map as a guide. At the first flight of steps turn right and immediately left to a garden which curves and at its end is a straight distinctly white alley with blue doors and windows. This is the heart of the Sephardic Quarter. The second door that has a sign above it will lead us to the Abohav Synagogue. (10) Rabbi Yitzhak Abohav was a very Torah scribe writer who was very well known in 14th century Spain. One of his books was brought to Safed and in his honor the synagogue was built. This is a very authentic synagogue where everything has a meaning, three Holy Arks representing the three fathers, twelve windows representing the twelve tribes etc. From the Abohav synagogue continue through the white alley under the dome immediately take a left turn up towards Karo St.(11) a street which has many gift and souvenir shops and stands. At Karo St. take a right turn, continue until you reach a wide staircase, these stairs run all along the old city and separate between the Jewish Quarter and the Muslim quarter of Safed, which is known as the artists’ quarter today. These stairs were built by the English after the 1929 riots where 18 Jews were killed. Walk all the down the stairs and then turn right after 150 meters a very impressive building will appear this is the house of Meiri (12) on e of the oldest preserved houses in Safed is an interesting museum which demonstrates the life of the Jews in Safed. 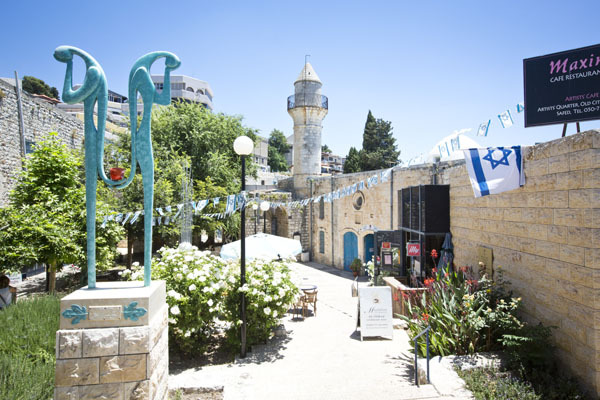 This Museum is an excellent spot to end the majestic tour of the old city of Safed.